Yesterday, the Pope awarded the archdiocese of St Paul and Minneapolis with its long-expected coadjutor, tapping Bishop John Nienstedt of New Ulm as heir apparent to Archbishop Harry Flynn, who turns 74 next week. Last June, Flynn told the archdiocesan paper that he had requested a coadjutor from the Holy See; the incumbent archbishop had been coadjutor for a year and a half before taking the reins of the 750,000-member Twin Cities fold in 1995. A Detroit native, the archbishop-elect -- who turned 60 last month -- is one of the US hierarchy's handful of prelates with a specialty in bioethics. A graduate of Rome's Alfonsiana, where he earned his doctorate in theology, Nienstedt served as secretary to Cardinal John Dearden during the latter's last three years as archbishop of Detroit, then returning to Rome for a six year stint in the Secretariat of State. He was ordained an auxiliary to Detroit's Cardinal Adam Maida in 1997 alongside Bishop Allen Vigneron, now head of the diocese of Oakland and often cited as another "rising star." 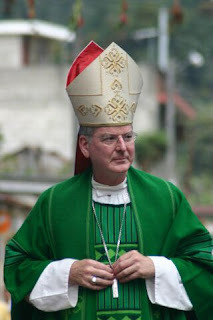 Nienstedt was transferred to New Ulm in 2001; he announced yesterday that, at his own request "in light of the Diocesan 50th Anniversary celebrations we have planned for 2007-2008" he's been appointed apostolic administrator of the rural Minnesota see until his successor is named there. Today's stories are a bit of a contrast: the Star takes a balanced look at the appointee's interests while the Pioneer-Press' hed screams "hard-line." Literally. As the long wait for a new head of Detroit's 1.5 million faithful continues, the appointment sends the signal that, though months off his 80th birthday, the long arm of Cardinal Edmund Szoka continues to hold sway on the Congregation for Bishops. The appointment -- to date, only the third of an American archbishop by Benedict XVI -- is noteworthy as, albeit "in-waiting," a metropolitan has been culled from within the province where he's currently serving as a suffragan bishop. While the last time that happened here came in late 2005, when then-Bishop Niederauer of Salt Lake was tapped for the archbishopric of San Francisco, yesterday's news is but the fourth instance of a US archbishop's elevation from inside his current province since 1993. As half of those owe themselves to the last two years, whether the trend toward in-province appointments will continue or are simply blips on the screen is anyone's guess. And further proving the current adage that "you know who's going somewhere -- it's figuring out where they're going that's the hard part," Ann Rodgers' July '06 list of eight names for Pittsburgh is now down to six, Nienstedt being the second from it to get another major post in as many months. The archbishop-elect arrived as the faithful of the Twin Cities bade their final farewells to a local legend, Msgr Richard Schuler. Hero to liturgy-philes and musicheads of a traditional vintage and for many years pastor of St Paul's nationally-known St Agnes parish, Schuler was called home last week at 86; the Star-Tribune relayed the comment that, 62 years a priest, he's survived by "many spiritual sons." This fall, the archdiocese will welcome the nation's largest class of incoming seminarians. Himself a formator of extensive experience, Nienstedt will take up his duties there in June.